Our teachers create a fun, informal, social setting that spurs engagement and supports each child's musical development. 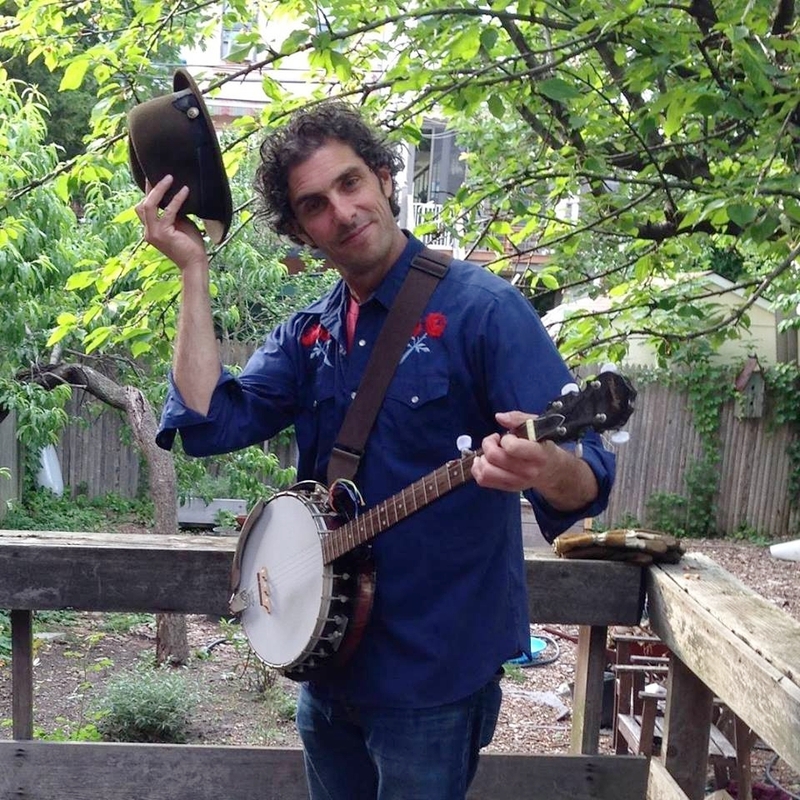 Pete Sinjin, sometimes referred to as ‘Hootenanny Pete’, has been doing this a long long time…and yet every new class feels like a brand new opportunity for laughing, singing, dancing, and playing, (with just a touch of educating…). He has literally been engaged musically with thousands of kids, parents, friends, families, and care givers for 15 years now, with musical experience way beyond that stretching back decades. In good times and bad, music is our salve, our comfort, our motivation, and our inspiration. Pete wants all the kids (and grown ups) that pass through the Hootenanny doors to know that, feel it, and take it on with them into their own lives. In his spare time Pete loves to paint. Check him out on instagram @petesinjin. When Kira Elisa Smith isn’t too busy emailing y’all or scheming up the next big Hootenanny event, she loves to dance. She hosts Hootenanny dance parties and occasionally teaches creative movement and yoga to any and every age! Kira has a MS in Dance Therapy from Pratt and is certified in Hatha and Kundalini Yoga, but her pride and joy is in gathering people together to celebrate and trying to make the world a better place. Hannah grew up in Ossining, NY and received a BFA in Painting from Tyler School of Art (Philadelphia and Rome) and an MFA from the Glasgow School of Art in Scotland. Her paintings have been exhibited near and far, including with Exit Art and Saatchi in New York. She has taught her process-based art classes for children in Los Angeles and NYC and is the art teacher at Brooklyn's Hootenanny Art Annex where she leads classes for ages 15 months through 2nd grade as well as collaborative family classes. Hannah loves to visit early childhood classrooms and after school clubs as a guest artist as well as organize art playdates and parties in private homes. Hannah’s passion for children’s art lies in open-ended materials, the capability of the child, and in a collaborative, social approach. Hannah lives in South Slope with her husband and two children. See Hannah's paintings at hannahkasper.com and follow @thisgreatforest on Instagram for her art practice for kids. Kim lives in Brooklyn with her daughter and husband and loves to design, sew and bake. Before teaching at Hootenanny, she found joy and success in the fashion industry for over a decade. Kim holds a BFA in Fashion and Textile Design from Moore College of Art & Design, the only all women's art school in the US. Kim encourages her students to be free and passionate and hopes to help cultivate strong artistic voices. Originally from Iowa, Cassie moved to Brooklyn in 2012 in search of a supportive, creative community of educators and artists, and to share her love of music, yoga, art, and theater with students of all ages. She now works as a music, yoga, and movement specialist at preschools, daycares, and yoga studios in Brooklyn and Manhattan teaching infants, toddlers, and preschoolers, as well as prenatal and post-natal yogis. Cassie is a nurturing, energetic teacher whose classes are imaginative, musical, collaborative, and FUN! Whimsical props, puppet play, live ukulele and singing, storytelling, and a whole lot of movement are a part of every engaging class. A seasoned performer and vocal teacher, as well, Cassie received her Bachelor’s Degree in Music Performance and her Master’s Degree in Music Performance from the University of Northern Iowa. She is also a certified Yoga Teacher, Children's Yoga Instructor, Kindermusik Teacher, Prenatal and Postnatal Yoga Instructor, and GoGo Babies Movement Instructor. To find out more about Cassie and her offerings, please visit www.get-brighter.com. Melina Gac Levin is an infant and toddler developmental specialist with over a decade of experience working with families and children both in and out of the classroom. Her passion lies in supporting young children and their families to find joy and comfort in themselves, each other and their community. She is enjoying experiencing things firsthand as the mother to a an active and curious toddler. Stephen Taylor grew up listening to Sesame Street Jamboree records in Newton, Massachusetts and played in bands at Milton Academy and Middleburg College. He has been teaching Music Together since 2002 and has taught music at Poly Prep Lower School since 2007. He now lives in Kensington and loves making music with you and your family. Michelle is a mom of two daughters, music therapist, early childhood music educator, sing-a-long leader extraordinaire, and occasional actress. She attended NYU's Music Therapy MA program and has worked as a therapist at The Heartshare School, Extreme Kids and Crew, Heartsong, and Baby in Tune. She has taught music at Lucy Moses School, Henry Street Music Settlement, Battery Park City Conservancy's Stories and Songs Program and Our Children's Center at CUNY. Michelle plays guitar, ukelele, and banjo, and has been teaching Music Together for many years. "I love encouraging my families to sing out loud, get silly, make live music and song part of everyday. I continue to marvel at the innate musicality of every young child." Lydia was raised in rural Pennsylvania and could always be found barefoot and adventuring. Whether she was catching frogs in the crick or battling dragons in the woods (stick sword in hand and dramatics in full effect), Lydia found joy through imaginative, expressive play. Thankfully, she didn’t have to let go of that imagination as her life led her to working with young children. After starting a teaching position in a preschool, Lydia soon realized her love for yoga and movement. She quickly found that children have a hundred languages of expression and one of the most under utilized ones is movement. This led her to pursuing her certification in both Children’s Yoga and Special Needs Yoga. Since then, Namaplay was born and Lydia created a program for children to explore yoga, movement, meditation, BIG feelings and play in an open and joyous environment. Five years later she is still chasing dragons through the woods, only this time with the back up of her little yogis. Lydia considers herself extremely fortunate to work with such incredible kiddos and privileged enough not to have grown up too much yet. Christie teaches Early Childhood Art at the Brooklyn Sandbox Early Learning Center during the school year and Woodworking at Brooklyn Friends School to elementary and middle school campers in the summer. Prior to Brooklyn Sandbox, Christie taught art for many years at the Trevor Day School in Manhattan. She has also worked for several NYC non-profits including the Children’s Museum of the Arts, Free Arts NYC, the Children's Museum of Manhattan, Harlem Children's Zone, and Publicolor. Prior to her career in education, she spent three years designing for the Manhattan Children's Theatre and has designed, propped, painted and built many shows in NYC. She has a Master's Degree in Art Education from Columbia University Teachers College and a Bachelor's in Theater and Dance from Trinity College. She currently lives in the South Slope with her husband and two children.